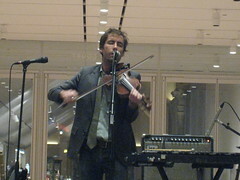 In front of a crowd of around 250 people, scattered at tables and chairs across the wide open floor of the Art Institute’s new modern wing, Andrew Bird showed yet again why he is a force to be reckoned with in today’s music scene. His short set drew mainly from Noble Beast, with a few nice surprises: an unanticipated side trip off into b-side territory (“The Water Jet Cilice”), a reworking of some old songs (“Sweetmatter”), and a new song that he’s been working on. The crisp, clean lines of the modern wing were well suited to a night of Bird’s music, who commented at one point that the environment made him want to play more legato music, broad strokes, instead of “pointy” things. The space really seemed to give Bird’s music the chance to grow and take shape, unconfined, to be whatever it wanted to be, the way his music should really be heard. Bird opened his set with “The Water Jet Cilice”, a song which has popped up a few different times on EPs (Soldier On, Fingerlings 3). The song’s long been a favorite of mine, and when I heard the opening strains, the churning violin and startling whistle, from way off in the middle of nowhere, aka where the restroom was, well, let’s say I walked just a little bit faster to get back to my seat. After the song, he talked to the audience for a bit, mentioning that he was asked to tell an anecdote about the Art Institute. He shared a story about going to the museum when he was around six, with his mother and some other neighborhood children. In looking at the paintings, he recalled standing in front of one – a Rembrandt – and really having the urge to touch it. So, of course, he did, and promptly got yelled at by the security guard. Somehow, I don’t think this was the type of anecdote that the organizers were hoping he would share – I imagine they were hoping for something a little more cerebral – but it suited the audience just fine. After the anecdote, he played “Sweetmatter” (the reworking of “Sweetbreads” and “Dark Matter”), and then into “Effigy”, which always works well in a solo setting. I think the solo voice + violin/guitar does well to convey the sort of awkward isolation that the song talks about (and which, as always, I think a large percentage of the audience can identify with). There was a tiny hiccup in the middle of the song as he switched from violin to guitar, only to turn in circles, looking for something that clearly wasn’t there or in reach. The violin loops kept going as someone handed him the capo to his guitar and the show, of course, went on. “Effigy” was followed by “Natural Disaster”, and then a new song. He didn’t give a title, but prefaced it by saying that it, like “Sweetmatter”, is a combination of an older song, an old spiritual, and some other stuff. I didn’t catch all of the lyrics, but the song definitely incorporated parts of “Keep Your Lamp Trimmed and Burning” and “Jesus Gonna Make Up My Dyin’ Bed”. The song seemed sort of bleak, but I was a little too mesmerized to focus wholly on the lyrics, so it’s very likely that I just didn’t get it. “Anonanimal” followed the new song, and I always enjoy seeing Bird perform this one by himself. With the full band, he invariably starts it out too fast, and either the band has to play like crazy to keep up, or he stops and restarts to come up with a more fair tempo. It’s not like the song was off to the races tonight, but it still felt like it fell into a faster groove than it has when I’ve seen him perform it with the full band. Bird’s been experimenting with adding guitar to this song lately; he’s been trying it out since Schubas/Lollapalooza in August, and he still hasn’t got the timing down quite yet. After finishing a verse on violin, Bird paused for a moment, trying to remember what came next. “Hold on a second,” he said, putting the violin down and reaching for the guitar. “I forgot about that.” Not perfection, but the earnest way in which he went about it makes up for any lack of polish or momentary forgetfulness. Finally, Bird rounded off his set with “Scythian Empires”, after debating with himself and the audience as to whether or not he should add on any more songs. He eventually decided to call it a night with that song, despite urging from the audience for two more, three more, a whole night’s worth of songs. As always, a beautiful set of music from Andrew Bird, who leaves the audience wanting more, but also leaves them wanting to sit back and digest what they just heard. 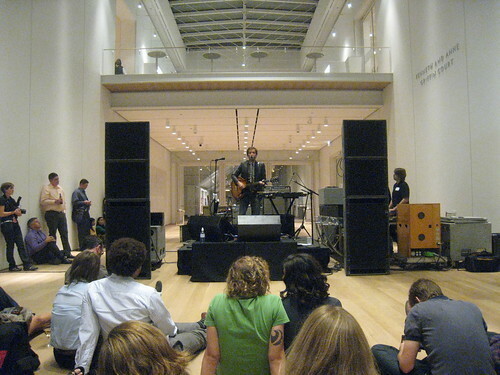 After he was done performing, guests were allowed to wander some of the galleries in the Modern Wing, which was a beautiful way to cap off the evening. Roaming around and looking at art that challenges your mind to see things in a different way was the perfect follow-up, in my opinion, to an hour or so of listening to music that does much of the same. I feel incredibly fortunate to have been able to attend this event, that I was able to bring a good friend with me, and that I had the opportunity (or sheer luck in timing) to be able to talk to Andrew Bird for a few moments (where I promptly had word vomit and tried to convey about ten ideas at once; I think he of anyone would understand an admirer’s social awkwardness) and take a photo. Maybe someday, I’ll be able to get those ten ideas all out in sequence instead of in a jumble and have a conversation instead of just hurling words of awe at the man. 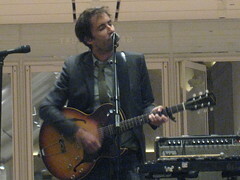 But if you’re out there, Andrew Bird, thank you for being kind and gracious and gifting us all with another night of gorgeous music. You inspire me as a musician and a writer, and I can’t help but come away from each performance feeling privileged to have been able to be a part of that sort of creation. 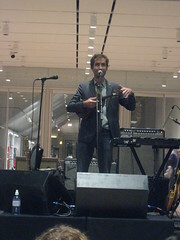 Andrew Bird + Modern Art + XRT = Heck Yes. Your pics suggest you were at the front center table. Is that right? If so, there were two fellow Pennsylvanians at the table behind you. That’s definitely me in the pic you linked! Such a small world. I couldn’t help but grin at that little bobble at the end of Scythian Empires, too — it’s moments like that which are some of my favorite moments from his shows, because there’s something so much more real about a performer who embraces the chaos that comes out of live performance. I am a musician — mostly symphonic band/wind ensemble sort of stuff, but I do sing and play guitar (badly) as well. I am familiar with Bethlehem/Allentown, though mostly just from driving through the area en route to other places. I’m originally from about 45 min. SE of Pittsburgh, but went to college at Penn State before moving out here. Chicago’s a great city, I absolutely love it here. Hopefully there will be some great music going on here on your way back through! Oh, btw, so this must be you on the left? This is getting even stranger because I, too, am a PSU alum (’00-’05 Psychology, Computer Engineering). Actually, that day I had just arrived from Happy Valley for the Penn St – Temple game weekend. By the way, going back made me feel really, really old. I’m not sure how old you are but I don’t recommend it. Yeah, there are some kinks in the commenting that I haven’t quite worked out yet. I’m mostly bad at the guitar — I know just enough chords to be dangerous — all the rest of my musical endeavors, I think I’m pretty decent at. I haven’t been back to PSU since graduating… I think about going back sometimes, but I feel old enough in my neighborhood here in Chicago, which is near a college campus, that I think going back to State College might just be too depressing.